One of the items on our holiday countdown list this year was to make ornaments to hang on the Christmas tree. To make something that we could treasure and hang on our Christmas tree for years to come. The best way to do that? A hand print ornament that I can look at each year to remember just how small they once were. These ornaments are so incredibly simple to make and are absolutely adorable once they’re finished! Made from a simple salt dough, once they’re dry they are heavy and durable (but can still be broken so you’ll want to be careful). And the best part is, you probably already have everything you need to make them! Continue below for the full step by step instructions or hit play on the video below for a visual tutorial. To make your salt dough, mix your flour, salt, and water in a bowl. Knead them together until you have a soft dough that you can easily form a ball with. It will stick to whatever you set it down on so either flour your surface or place it on a sheet of wax paper. Working quickly so your dough doesn’t start drying out, flatten it out and press your child’s hand into the dough creating their hand print. One thing to remember is that salt dough is heavy when it dries so remember that when you are deciding on the thickness for your ornament. Once you have a good hand print, use a butter knife dipped in flour to cut your hand print out and lay it on a cookie sheet. 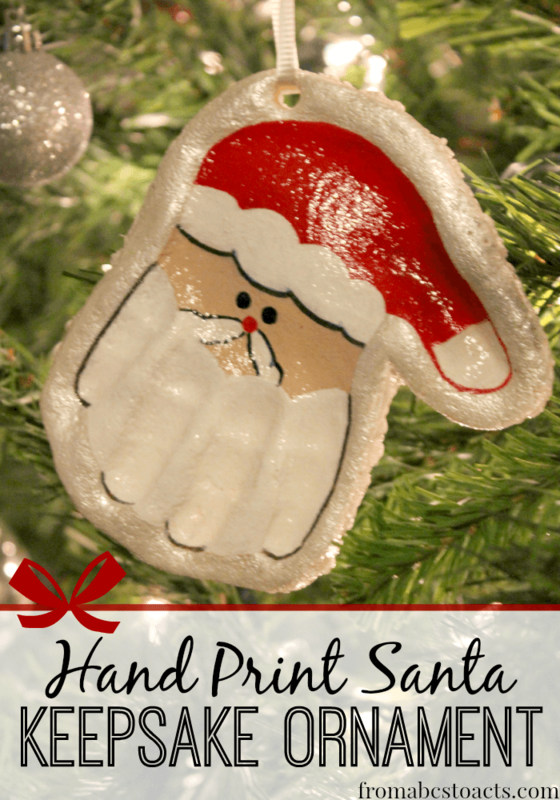 Make sure that you cut a small hole at the bottom of your hand print so that you will be able to string a ribbon through to hang your ornament. Your ornaments will need to be completely dry before you try to paint them so stick them in the oven at 200º for 3 hours (or until they are completely dry depending on their thickness). Once they’ve completely cooled, start creating your Santa! You can section off the parts of Santa’s hat and beard before you get started to make it a little easier. We just used a black permanent marker on the beard and the bottom of the hat and red paint for the rest. Now you’re ready to start filling St. Nick in. You’ll want to fill in the rest of your hat with that same red paint, grab some white for the beard and to finish the hat off, and for the face you’ll want to see if you can find either a beige or flesh colored paint. If you’re unable to find one that you like, you can mix a few colors together to make your own. For our Santa, we wound up mixing this with a more antique white paint and I love the way it turned out! Again, you can use a black permanent marker for the eyes and the outlines of his mustache and it will work just fine. We decided to jazz our Santa up a bit with a little metallic silver paint around the edges but you could just leave him the way he is if you’d like. He’s adorable either way! Finally, once you have your Santa just the way you want him, coat your entire ornament in Mod Podge to seal it. Both the original version and the spray sealant work perfectly. Now grab a ribbon or some string and hang him on the tree!